Here's a list of FAQ's, we try to anticipate questions you might have about our services and provide the answers here in our Frequently Asked Questions. Firstly, a few points to consider before hiring our portable toilets. * We need to ensure there is adequate space to manoeuvre the portable toilet. * Toilets cannot be placed above ground level or in basements. * Think about the placement of the toilets, is it suitable for your guests. * Please bare in mind our toilets rely on natural lighting. * Once your event is complete, toilets can only be moved once emptied. l. What is included in my price for toilet hire? Delivery, waste disposal and collection - 24hr service. Setup and full onsite testing of the toilets before leaving. The toilets will be stocked with all consumables for the length of hire. 2. Delivery, unloading, siting and collection - What happens? We will deliver to you on the day at the time specified. If for any unfortunate incident we are late our driver will call you and be contactable at all times. One of our team will discuss with you during your first discussion the location of the toilets to ensure we have enough room for our vehicles. Our professional, efficient team will do it all for you from delivery, unloading, siting, waste disposal and collection. 3. Do we clean the toilets when on site? Your toilets will be delivered in a perfectly clean condition. Hire less than a week we will not be responsible for cleaning them. If however you do require attendant this can be discuss with our team. If hiring for more than a week, we will visit, clean, empty and restock the toilets on a weekly basis. 4. What if there is a problem with the toilet once on site? We offer an emergency service which means we are contactable 24/7 to assist if a problem does arise. 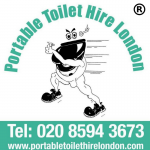 Any further questions on your portable toilet hire? Call - 020 8594 3673.